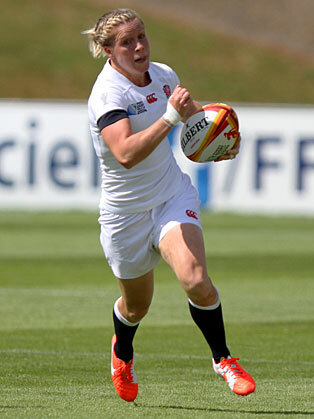 Danielle, also known as Nolli Waterman, is a Rugby World Cup winner and one of England’s Sevens leading lights. With her years of rugby experience and sheer awe inspiring talent on a rugby pitch, she is a firm favorite to be on the plane to Rio in 2016 as a member of the first ever women’s Great Britain Rugby Sevens squad. Nolli’s exploits also include scoring the opening try in the 2014 Rugby World Cup Final, which saw England go on to be crowned world champions for the first time in 20 years. She also competed in the 2010 and 2006 Rugby World Cups where England finished second, and has been nominated for the World Rugby Player of the Year and IRPA Try of the Year awards alongside other greats from the international men’s and women’s game. When Nolli made her debut in 2003 she also became the youngest ever player to be capped by England at 18-years-old. Fast-forward 11 years and the 30-year-old also became one of just one 20 players to be awarded a professional playing contract for the first time ever in 2014. With the Olympics in 2016, and England looking to defend her RWC title in 2017, there is still a lot to come from Nolli Waterman.